Written by Duncan Fremlin, Broker. In 2011, I was invited to join the first Cabbagetown chapter of Business Networking International. I didn’t know it at the time but this weekly breakfast with 20 successful neighbourhood entrepreneurs would forge friendships and business relationships that continue to enrich me today. One such friendship is with local resident and graphic designer, Peter Lovering. Peter contributed greatly to our group but one of his ideas went on to spawn many other relationships and as a result, local businesses have prospered. 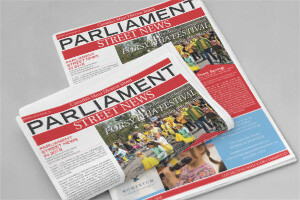 You’re reading the fruit of that idea right now, Parliament Street News. This is a community newspaper in the truest sense of the word, published by a Cabbagetowner with content supplied by local residents. In a world where much of what we read is suspect, this local publication has set a very high standard that we can all enjoy four times a year. For that, we can thank Peter. I doubt I’d be able to appreciate the number of hours Peter devoted to this publication. It was a labour of love if ever there was one. But now, with this issue, PSN moves on to it’s new publisher, Sarah Cook. As someone who has written often for PSN, I’m grateful for Sarah’s obvious commitment and passion for PSN and Cabbagetown. I look forward to writing and reading about this great neighbourhood for many years to come. Thank you Sarah!